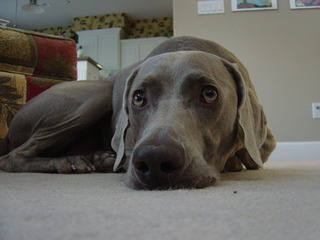 Before I begin, I must say that my heart belongs to a Weimaraner named Scout. Part of his story is told here, but I can't really tell it all, both because I was not privileged to know more than his first few years and because his not being with me any longer makes me too emotional to tell the truth about it. That's Scout, upside down and gazing at me. It's how I remember him best, vulnerable yet dignified... a girl's best friend. When I was a little girl, I'd spend summer afternoons on the concrete steps of my neighbor's house. She was a single, middle-aged woman who owned a townhome across the parking lot from ours, and she owned four cats... Rory (an extremely affectionate, extremely large yellow tabby who, later in life, was hit by a car but survived, though he lost a leg... watching him get around tripod style, without losing any weight, was impressive), Sheba (a shy, nattily groomed Persian with big blue eyes, declawed in her front two paws), Maggie (a scruffy, gentle Calico who loved sharing her fleas with the neighborhood kids), and a fourth who I almost never saw. Anyway, I'd kneel on the steps, letting the scratchy concrete warm my bare, knobby knees, and stroke and pet and scratch those cats until they were purring thunderously. But I still never wanted a cat of my own. Dogs were my bag. I wanted giant, rough-and-tumble, fetch-playing, drooling, smiling, lazy, galumphing, stout-hearted dogs. I wanted dogs with barrels of whiskey secured under their chins, dogs who could flip their floppy ears and jowls 360 degrees as they shook water from their coats, dogs with baritone barks and ponderous paws. I wanted Bloodhounds and St. Bernards and Newfoundlands and Huskies and Ridgebacks and Dobermans and Mastiffs and German Shepherds and Wolfhounds and Chows and a thousand other big, beguiling breeds. You get the picture. Cats were too quiet, too prim. They screamed when they fought at night, and their careless claws left fiery welts on my tender skin. They couldn't do anything but rub against my pant legs or purr into my flat palms. No hero or heroine of literature had ever taken on the Oregon Trail, the Mississippi River, or the Pacific Ocean with a cat. Dogs were the right choice for adventure, always. Think of Where the Red Fern Grows. Think of Old Yeller. Think of Island of the Blue Dolphins. My parents bought our first and only family dog when I was fifteen years old. Scout was and is the loveliest, most precocious dog I've ever seen, and I loved him more than I'd loved any animal in my life to that point. Every transgression (and oh, there were many!) was forgiven and forgotten by my family, even as Scout dug holes in the yard, scratched up our floors, urinated on our hearth, and nipped at the unsuspecting fetlocks of our visiting neighbors. Dear Scoutie (at Left), a cuddlebug who preferred to be curled up under the covers on any of our beds, an affectionate darling with an endless supply of kisses, would terrorize any and every visitor to my parents' home. The doorbell would ring, the knocking would echo down the corridor, and Scout would let out an unholy howl, tearing from the living room into the foyer, his lanky legs tangling as he rounded the corner, scuttling on the cold tiles as he propelled himself to the front door. If the friend or neighbor entered the house, they'd either be cornered by our leaping, sniffing, bellowing animal, or they'd be quickly scooted into the house while whichever of us answered the door wrestled Scout away and calmed him down. Sometimes both. 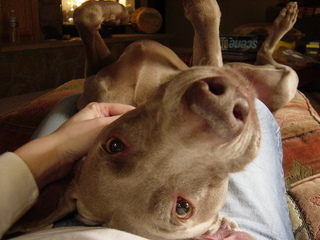 Scout McGillicuddy Pancoast, Weimaraner extraordinaire, was the neediest dog in the world. He "needed" to go outside seven times each hour, and he alerted us to this fact by trotting to the door and stepping on that little spiral-spring doorstop apparatus at the lower corner and letting it boi-yoi-yoi-yoi-yoing back into place. My parents and brothers and I were programmed to rise and open the back door whenever we heard that sound. It was Pavlov's study in reverse! 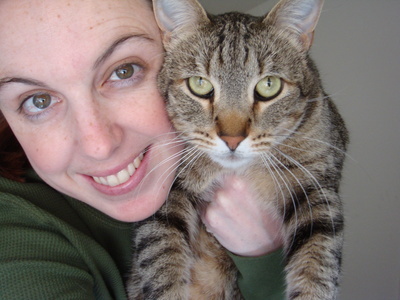 While in high school, when I suffered the occasional terrible injustice and spent an hour sobbing in the middle of my room, prostrate on the carpet, Scout nosed his way under my arm and licked my face until I had to stop crying. When Mom was up early with a headache and went downstairs to watch a cooking show in the wee hours of the morning, Scout would curl up on her feet and sleep. He adored each of us, though Mom was his favorite, and took turns in our beds and eating from our secretive hands beneath the dinner table. We made a terrible beggar out of him, and allowed him to sit in a chair at the table like the person he believed he was. One day, though, even Scout went too far. He snapped at my friend and broke her skin. It was the last straw. My parents couldn't tolerate having a dog who made the house dangerous. They couldn't allow such a liability to run around the house snapping and biting at people. And so we went through the tortuous process of giving up Scout. We didn't put him down. He was too beautiful, too vital, too sweet for that, really. We knew his soul was angelic, behind those demon jaws. Eventually, the folks took him to a doggie rehab center where he was put through the paces and retrained (or perhaps truly trained for the first time, as he'd been an Obedience School dropout in our care), and finally adopted by another family. Each of us mourned in our own way. Ted was in Iraq and missed the family drama. Curtis was spiteful, but so, so sad. Dad considered himself a failure as a dog owner, and everyone knows that Pancoasts would rather die than fail. Mom's heart splintered at the seams and, though the bulk of it healed over time, she still gets nostalgic and damp eyed when she thinks of him, as do I. 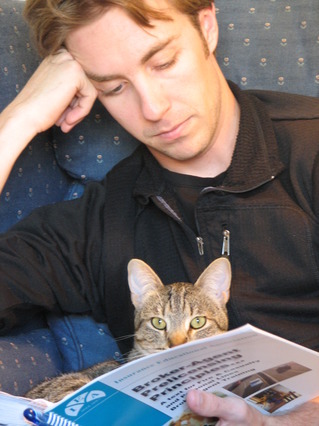 Scout was gone a few months before Jon and I married, and so I lost my first loving companion animal, my only real pet. Jon's cat, Crypto, was and is a fat, fluffy bundle of nerves. She's a one-man cat, and she loathed me for years. I knew right away that I needed something small and furry to snuggle and coo at and dote upon, too. One month after we'd moved into our new home together, we decided it was time to get a cat for me. (No dogs in a house with Crypto... period. Mostly because that would end badly for the dog.) Someone to love me and snuggle with me and purr on me. Someone who would choose me over Jon and would never plot to kill me in my sleep. There were three cats in the room. One older cat who raised a disinterested eyebrow and sighed at me before going back to sleep, and two twinkle-eyed kittens who immediately began to climb on me, sniffing curiously. They were brothers, one a gray tabby and the other ink black. Both tripped prettily over their own large paws. Both twirled and scampered after my hand which I ran back and forth across the floor like a tarantula. But the tabby was the one who let me cradle him like a baby, let me put my face against his, let me finger his paws and kiss his nose... no protests, no squirming, just increased purring and big, loving eyes... that's my Disney. He has never scratched me intentionally. He has never bitten or hissed or spat at a person. He treats Crypto like his reluctant big sister, choosing to sleep nestled at her side whenever possible. I can stretch him to an almost comic length, his body arced back like a bow or a crescent moon. 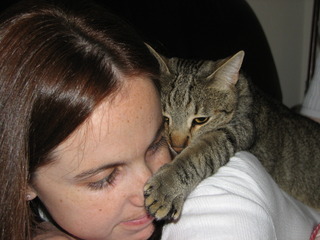 He lets me squish his face, pinch his ears, trim his claws, toss him through the air, bury him in blankets. And he always, always loves me. So, while I still dream of owning a ranch in New Zealand with hundreds of acres where my hodge-podge pack of giant, eager dogs can run and roam, while I still melt every time I see a Weimaraner and the street and stop to pour out excess Scoutie love on each of them, I am also a cat person. Disney has converted me.